I still can't imagine how the advent of technology can do wonders. Would you believe that the actual background of this picture of me and my niece is a native restaurant structure? If you look closely, the roof of the structure is made of bamboo and Nipa palm thatch while we were sitting in a bamboo-made chair. 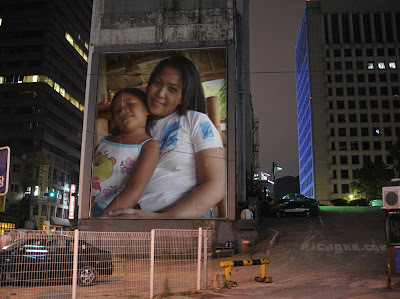 So in this picture, we were flown from the beach side scenery to a wide hanging billboard in wherever vast city is this, LOL! Anyway, I just thought this is cool. I was reading online casino news when JK sent it to me. He's so fond of playing with pictures and he takes them as far as his imagination can reach. I got lots of them!